Used to be, I thought we only had two options when it came to swimming in Hawaii: Head to the pool or head to the beach. Not so! There’s actually an in-between option: Hawaii’s magical tide pools. ***NOTE Tide pools can be VERY dangerous & unpredictable and should only be visited during calm waters. Check weather and tide conditions before venturing out to these spots. At Hawaii’s tide pools, you get the best of both worlds — the serenity and beauty of a beach plus the calm currents and calm waters of a pool. What’s more, most of the tide pools in Hawaii are home to some really cool ocean creatures, such as hermit crabs, fish, and sea cucumbers. So, the kids can explore all day long. 1. Sandy Beach Tide Pools (Oahu): I’m putting these tide pools first because, so far, they’re my favorites. If you’re looking at Sandy Beach on your right, the tide pools are the next “driveway” over. Just park on the dirt and pick a spot on the sand. When the tide is low, the tide pools are safe enough, even for small children. When it’s high, you get a breathtaking view of the sea spray against the rocks. Take a refreshing dip or just float around and explore. 2. Queen’s Bath (Kauai): I’ve heard so much about the Queen’s Bath tide pool that I can’t wait to check it out when we visit Kauai in a couple of weeks. Apparently, the tide pool is a sinkhold surrounded by igneous rock. It’s located in Princeville, and you’ll need to hike a short trail to get there. Small fish and tiny sea life also live in the tide pool, such as Hawaiian sea urchings, angelfish, and the so-called “ghost fish.”WARNING: In the winter, during periods of high surf, it’s considered dangerous. In fact, at least seven people have drowned after being swept off the rocks by unexpected waves. You'll need to hike a short trail to get to Queen's Bath Tide Pools on Kauai. 3. Makapuu Tide Pools(Oahu): Just up the street from the Sandy Beach Tide Pools, you’ll find the Makapuu Lighthouse Trail, which is uber-popular with tourists. A little ways up, you might notice some folks literally climbing up and down the side of the cliff. This is your cue that you’re in the right spot! Although the climb can be difficult for beginners, experienced hikers should be fine. At the bottom, you’ll find a landscape of beautiful tide pools made even more spectacular with the background of magnificent sea spray. 4. Kapoho Tide Pools (Big Island): Since the Big Island has some of the “freshest” lava in the state, it’s no surprise the island has fantastic tide pools. Some of our favorites are the Kapoho Tide Pools. Located on the Kapoho Coast of the Big Island of Hawaii, the Kapoho Tide Pools are an unusually large grouping of tide pools and spring fed pools that stretch out for roughly one mile along the shoreline and extend as much as 600 feet out into the Pacific Ocean, according to city-data.com. The website also states that the tide pools are crystal clear and brimming with sea life. From the top of Makapu’u Lighthouse trail, you can see the point and the tide pools below. 5. 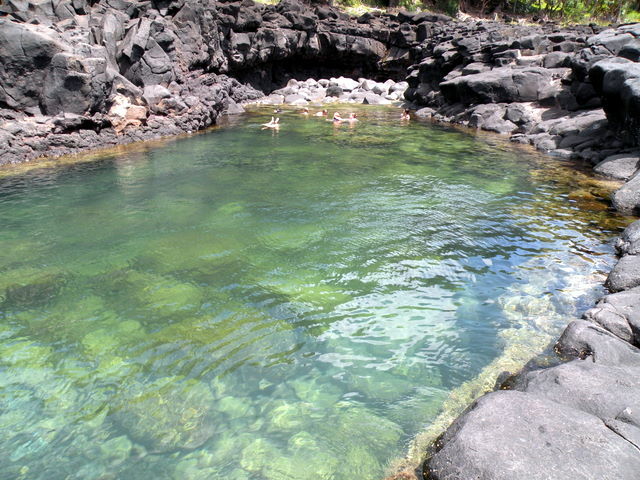 Olivine Pools (Maui): The Olivine Tide Pools are Set 12 miles north of Kapalua and 4 miles past the Nakalele Blowhole. 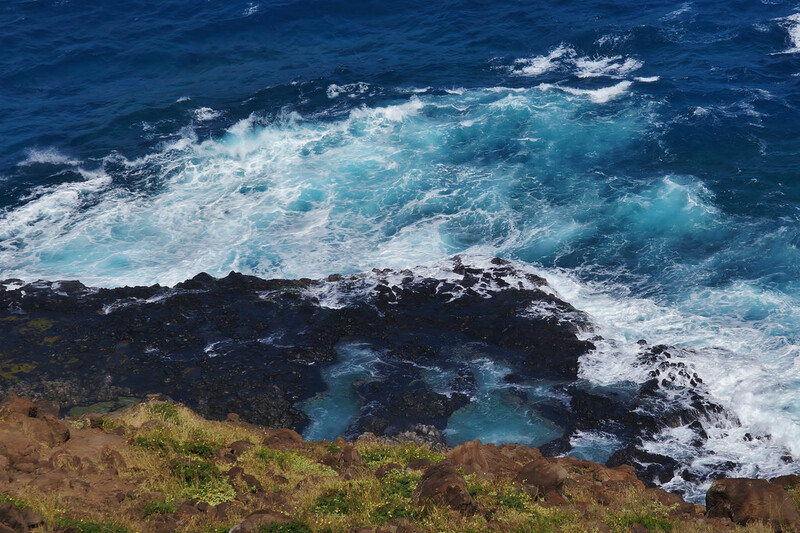 According to Hawaii.com, When the wind and surf are elevated and rough, waves wash over the low-lying point and cover the rocks with water, where much of it gathers, pools, and stays entrapped in the slippery black rocks. When the surf subsides and the wind calms down, the result is tide pools deep enough for swimming or simply floating on your back. I can’t emphsize enough how important it is to be safe around all tide pools (after all, they’re formed by waves crashing onto rocks!). So, you may even consider making a tide-pool side-trip during an Oahu Circle Island Tour or Big Island Circle Island Tour, so you have experienced tour guides along with you to watch for tides and waves. If you go on your own, make sure you always have someone on “lookout” duty to watch for rogue waves. Tide pools are some of my favorite places to take a refreshing dip while exploring some pretty cool marine life. We think you’ll love them, too. So, check-out these top 5 tide pools in Hawaii, and enjoy that “middle-ground” between the ocean and the pool!